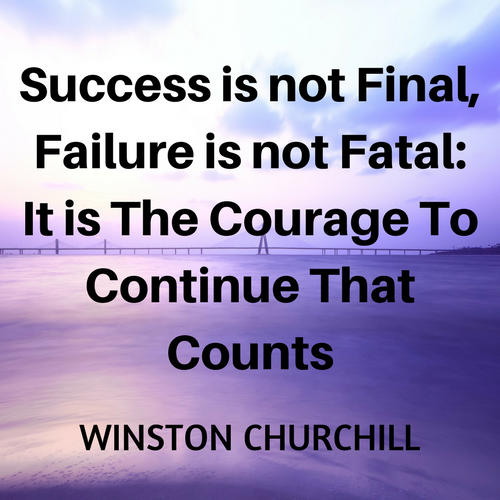 I love this quote which is often attributed to Winston Churchill. He might not have said this word for word, however he said on the 13th of December 1940: “Success always demands a greater effort”, which is along the same line of thought. The more I read “Success is not final, failure is not fatal: it is the courage to continue that counts” the more it inspires me and strengthens my belief that perseverance is a sign of courage. Success is not final: as you know success is a journey for growth. Once you have reached your goals, you set up new ones and embark on a new journey to success with new goals. Failure is not fatal: countless of people fail or ‘fall forward’. They fall forward because they pick themselves up, they bounce back by learning from their mistakes or by finding the courage to try again. They do not let the fear of failure break their stride. It is the courage to continue that counts: sometimes we start and then we stop half way because we become discouraged, impatient and fearful that we might not succeed. And sometimes we lack the courage to even start because we apprehend failure or we know a lot of efforts will be required. However, we show courage when we demonstrate patience and we have the ability and willingness to stay the course. Therefore, we have to keep the faith. If you do, that's great! Be clear about your end in my mind; in other words, be clear about what you want. As you focus on the essential, clarity brings order to your mind and it will help you develop courage. 2. Be clear about your Why? Your why is the reason why you want to take your life to the next level in the first place? I like using the example of sports men and women when it comes to courage because there are a real testimony of mental and physical strength working in sync. The right story is that you will succeed no matter what. Falling forward is success in itself: it is always best to attempt something than wondering ‘If only I …….’. Mo Farah was determined to return to Britain with a gold medal. In 2011, he competed for the 10,000m at Daegu World Championship in Athletics. It was painful to watch yet so exhilarating! His 200m sprint ﬁnish to race away from his competitors meant that the gold medal was his. However, as he closed on the ﬁnish line with 50m remaining he got beaten by the Ethiopian Ibrahim Jeilan. This is the race Mo Farah wanted to focus on, he said after the race: “It’s a great feeling once you cross that line in ﬁrst place – an unbelievable feeling. I didn’t have that feeling today.” In spite of his near victory, Mo Farah knew he could win a gold medal and that he should not miss this chance. Through sheer determination, he decided to run the 5,000m a week later. As a result, he not only took gold in the Men’s 5,000m ﬁnal but also became the 5th male athlete to complete the long-distance double at the championships. He returned to England with the gold medal and fulﬁlled his dream. You can be encouraged or discouraged by others however, the only person you are answerable to is yourself. Of course, others might inspire or motivate you and instill confidence in you however you have to take the first step and make the decision that is right for you. In fact, courage comes from your core. 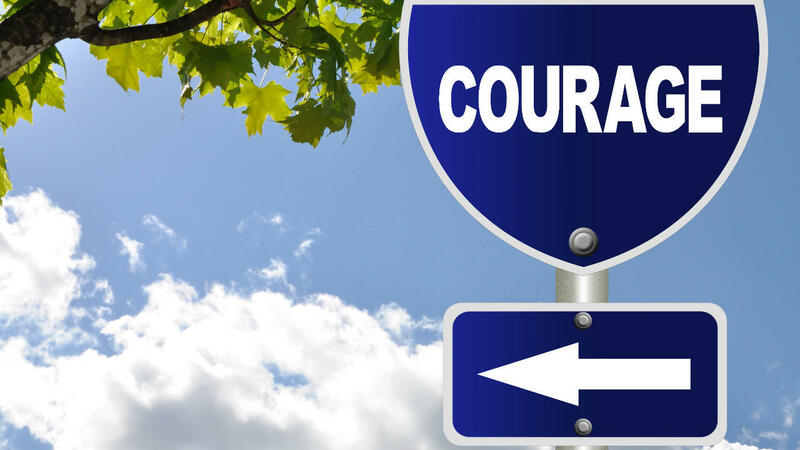 The word courage originates from the Latin ‘cor’ or heart and old French ‘corage’. This means that courage emanates from the heart as the seat of feelings. Thus, courage is expressed at a deep level and is developed from the heart. This raises another question: do you lack courage sometimes because what you want and expect is not in alignment with your heart? The choice that you make will determine the outcome and whether you find courage or not. Connect and listen to your heart more often to develop courage. Like Susan Jeffers says: ‘Feel the fear and do it any way.’ Attempting at something is always better than not doing anything about it at all if you choose to create a new story. A certain level of fear is good, it shows that you are in the discomfort zone and in this zone miracles happen. When you choose to overcome fear you choose to focus on what lies beyond it: freedom, happiness and success. Could f.e.a.r (false expectation appearing real) be an illusion? It is worth considering that fear might be a story that we tell ourselves because when courage calls we are able to show courage and we are quick to respond. The example I have in mind is when we are faced with danger; our survival instinct gives us the courage to fight or flight. You might be thinking well I tried in the past but it didn’t work. What did you learn from it though? What could you do differently this time around? Align yourself with greater trust and faith. I believe that when you have these 5 points in place your trust and faith will be strengthened and you will find the courage to take your life to the next level. Many things were accomplished with a leap of faith. However, even though your trust and faith must be strong, this is not enough. You must resolve also to take action. Remember that success always demands a greater effort. 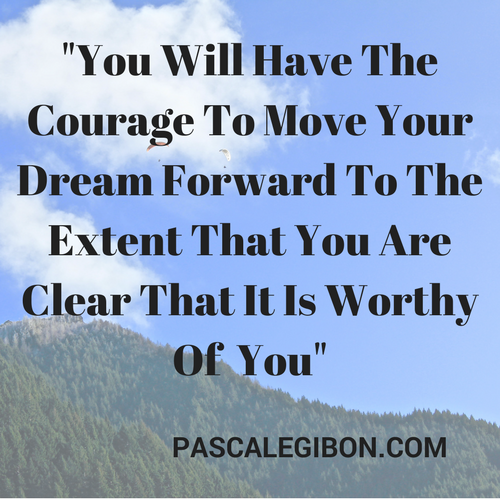 What action are you going to take to develop courage? Free resource: Are you ready to take your life to the next level, to create lasting and positive change and develop courage? Get your FREE copy of ‘The Top 10 Mistakes Men and Women Make to Create Change in Their Life & How You Can Avoid Them and Improve the Quality of Your Own Life’ and start transforming your life today.